Spotless – Civic Theatre – Review by Frank L.
On 1st January 2019, the law in relation to abortion was transformed following the enactment of the Health (Regulation of Termination of Pregnancy) Act 2018 as a result of the repeal by referendum of the 8th amendment to the Constitution. The consequences of these changes are pivotal to the play. Genevieve (Ciara O’Callaghan) has been married for over fifteen years. She and her husband have been ‘trying’ for years and despite being involved in every type of therapy, there is still no sign of a baby. This has involved them in considerable expense and has forced them to downgrade to a ‘mixed’ inner city area which has at least the advantage of being near their work. Jen (Emma Willis) is doing her Leaving and lives in the flats near to Genevieve. Her mother, a junky, died when she was eleven and she lives with her alcoholic wastrel father. She has her head screwed on and knows that education is the key to altering her situation in life. She is, therefore, studying hard for good marks in the Leaving but like any teenager she likes to enjoy herself including to dream. Some of those dreams centre on Dean, a guy a bit older than her who captivates her. These three individuals become entwined. There are intimate scenes between both Dean and Jen and Dean and Genevieve. Yet in these scenes with Dean, either O’Callaghan or Willis , as the case maybe, speak Dean’s words in the shadows of the stage. No attempt is made to give him a physical presence. Each member of the audience is therefore able to imagine in whatever physical form they may choose the male presence of Dean. He is a figure of threatening reality. The set consists of two smallish platforms of which one is a bedroom, a cluttered space which Jen inhabits, while the other is a modern lean living space where Genevieve and her husband have recently come to make their home. Each space represent the different worlds of Jen and Genevieve. O’Callaghan and Willis are together on stage for almost the entire length of this play which lasts for ninety minutes. Their interaction is finely tuned and the ease with which they represent their different worlds is impressive. 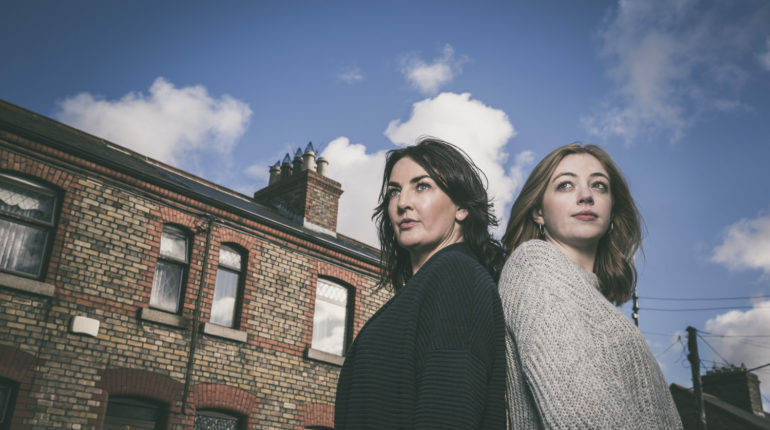 The play has moments of high tension and it brings to light the new realities that are emerging and will continue to emerge in relation to the new abortion legislation. This play would have made no sense prior to the 1st January 2019. It now does. Spotless allows for new discussions to take place about pregnancy, both its creation and termination. This is a thought-provoking and rewarding new work, about some of the new realities of modern Ireland. TOURS – (8 April – 9 May): Dolmen Theatre, Cabinteely (preview) / Theatre Royal, Waterford (preview) / Civic Theatre, Tallaght (premiere) / The Belltable, Limerick / The Whale, Greystones / Smock Alley Theatre, Dublin / Hawkswell, Sligo / Town Hall Theatre, Galway / The Everyman, Cork – Full Details here.